Poquoson, VA – She’s been stripped down, torn apart, every inch of her frame inspected, curves of her body smoothed out, brand new outfit! Today is the day all that hard work over the short off season – in retrospect to all of the other professional sports– finally pays off. Greg Edwards has worked hard over the past few months to get ‘LaFawnduh’ back in tip top shape and ready to lay some rubber at Langley Speedway this season. Much like all the drivers that I have been honored to chat with over the past few months, Greg Edwards started young. “I started racing motocross at 11 years old,” Edwards told me. “Then I went to karts when I was 14.” Spending just two years in that kart before moving up to full bodied vehicles like the Grandstocks when he was 16. Continuing up the ladder Greg made the move to Late Model Stock Cars at the age of 19 and has never looked back! Edwards looks to come into 2014 even stronger than last year. The three time Langley Speedway Champion wrapped up 2013 with an 8th place finish in the NWAAS Virginia State points with 3 wins, 13 Top-5’s and 16 Top-10’s. In addition, Edwards finishes 4th in the final points standings at his home track Langley Speedway, a 17th place finish in the Denny Hamlin Short Track Showdown (Driving for Randy Sears), a 13th place finish in the Southern National All-Star Classic, and a 33rd place finish at Myrtle Beach. 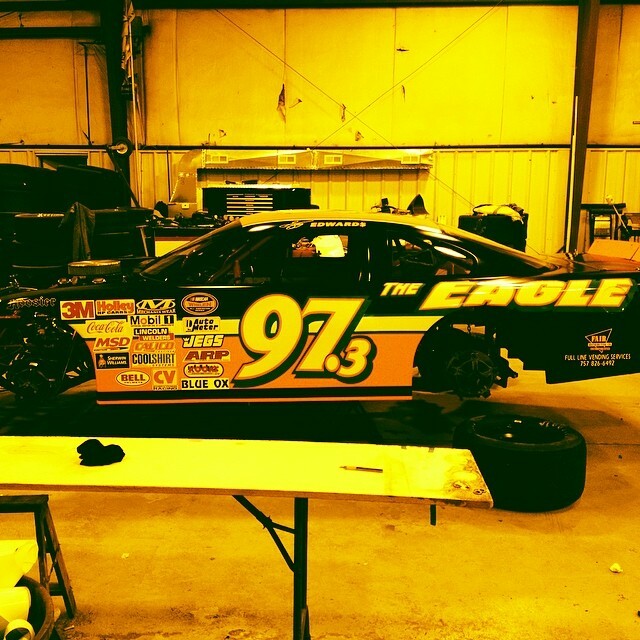 Head over to Greg’s Driver Series page to continue to read the rest of our interview then get ready to head out to Langley Speedway to help cheer on Greg and the rest of the 97.3 The Eagle Crew on opening night.